Broken Bells is an American indie rock band composed of artist-producer Brian Burton (better known as Danger Mouse) and James Mercer, the lead vocalist and guitarist for the indie rock band The Shins. Broken Bells compose and create as a duo, but are joined by Dan Elkan and Jon Sortland when performing live. The previous live band included Conor Oberst and the Mystic Valley Band sidemen Nate Walcott and Nik Freitas, and Jonathan Hischke and Dan Elkan, both ex-members of Hella. Following their 2010 self-titled debut album, the duo released an EP, Meyrin Fields, in 2011 and their second studio album, After the Disco, on February 4, 2014. Brian Burton and James Mercer decided to work together after meeting at the Roskilde Festival in 2004 and finding they were fans of each other's work. It took four more years before the two started working together and by March 2008 Mercer and Burton began recording together in secret at Burton's Los Angeles-based studio. The project was first announced on September 29, 2009. The two described their material as "melodic, but experimental, too." Prior to the formation of Broken Bells, Mercer and Burton both worked together on the track "Insane Lullaby" on the album Dark Night of the Soul by Danger Mouse and Sparklehorse. Broken Bells have since performed the song several times, often as a tribute to the late Mark Linkous, the Sparklehorse frontman who died in early 2010. Broken Bells self-titled debut album was released in the United States and Canada on March 9, 2010 through Columbia Records, and has sold over 400,000 copies domestically, peaking at number 7 on the Billboard 200 chart. The album has received positive reviews. Rolling Stone magazine gave it a four-star review and stated that it was "the year’s coolest left field pop disc." Besides their album being among the year’s highest charting debut albums, the band had sold out shows on their first ever tour. Broken Bells released an EP titled Meyrin Fields on March 18, 2011. On February 14, 2012, in an interview with KINK.FM (a Portland, Oregon radio station), James Mercer stated that he was currently working on Broken Bells' second album. On October 8, 2013, the band announced the release of its second album, After the Disco. Broken Bells released their lead single from the album, titled "Holding on for Life", on November 4, 2013. After the Disco was released on February 4, 2014. That same day they covered "And I Love Her" alongside footage of Ringo Starr on an old television as part of the "Late Show With David Letterman" "Beatles Week" to celebrate the 50th anniversary of the band's debut appearance on "Ed Sullivan". The band performed "Holding on for Life" on the March 7, 2014 episode of "The Tonight Show Starring Jimmy Fallon". Broken Bells were nominated at the 2011 Grammy Awards for Best Alternative Music Album. ↑ "October" did not enter the Rock Songs chart, but peaked at number 24 on the Rock Digital Songs chart. ↑ Bronson, Kevin (February 22, 2010). 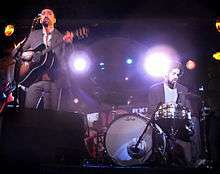 "Broken Bells Debut New Songs at L.A. Showcase". Spin. Retrieved March 14, 2010. ↑ Hewitt, Ben (January 22, 2010). "The Odd Couple: Broken Bells Interviewed". The Quietus. Retrieved February 16, 2014. ↑ Gormley, Ian (March 2010). "Broken Bells: James Mercer and Danger Mouse". Exclaim!. Retrieved February 16, 2014. ↑ Adams, Sean (September 29, 2009). "The Shins' James Mercer + Danger Mouse = Broken Bells! Greatest News Of the Year". Drowned in Sound. Retrieved January 9, 2010. ↑ Diehl, Matt (September 30, 2009). "Danger Mouse, The Shins' James Mercer Explain the Birth of New Band Broken Bells". Rolling Stone. Retrieved January 9, 2010. ↑ Harding, Cortney (February 9, 2010). "Danger Mouse, James Mercer ring in Broken Bells". Reuters. Retrieved February 3, 2014. ↑ Hermes, Will (March 3, 2010). "Broken Bells Album Reviews". Rolling Stone. Retrieved February 3, 2014. ↑ Nellis, Krystina (April 18, 2011). "Ep Review: Broken Bells - Meyrin Fields". Drowned in Sound. Retrieved February 3, 2014. ↑ "James Mercer of The Shins - Interview in the Bing Lounge". YouTube. February 14, 2012. Retrieved February 3, 2014. ↑ Geslani, Michelle (November 4, 2013). "Listen: Broken Bells' new song, "Holding On For Life"". Consequence of Sound. Retrieved February 3, 2014. ↑ Beauchemin, Molly (March 8, 2014). "Watch Broken Bells Perform "Holding on for Life" on "The Tonight Show"". Pitchfork. Retrieved March 9, 2014. 1 2 "Broken Bells Album & Song Chart History". Billboard 200 for Broken Bells. Prometheus Global Media. Retrieved February 16, 2014. ↑ "Australian Album Chart". australian-charts.com. Retrieved February 16, 2014. 1 2 "Discografie Broken Bells". ultratop.be (in Dutch). Hung Medien. Retrieved October 1, 2016. ↑ "Broken Bells Album & Song Chart History". Billboard Canadian Albums Chart for Broken Bells. Prometheus Global Media. Retrieved February 16, 2014. ↑ "Danish Album Chart". danishcharts.com. Retrieved February 16, 2014. ↑ "Finnish Albums Chart". finnishcharts.com. Retrieved February 16, 2014. 1 2 "French Albums Chart". lescharts.com. Retrieved February 16, 2014. ↑ "German Albums Chart". charts.de. Retrieved February 16, 2014. ↑ "Swiss Albums Chart". swisscharts.com. Retrieved February 16, 2014. ↑ "BROKEN BELLS | Artist". Official Charts Company. Retrieved February 16, 2014. 1 2 "Canadian certifications – Broken Bells". Music Canada. Retrieved November 15, 2013. ↑ "Broken Bells Album & Song Chart History". Billboard Top Alternative Albums for Broken Bells. Prometheus Global Media. Retrieved February 16, 2014. ↑ "Broken Bells Album & Song Chart History". Billboard Top Rock Albums for Broken Bells. Prometheus Global Media. Retrieved February 16, 2014. ↑ "Broken Bells to release new EP next month". NME. March 2, 2011. Retrieved February 3, 2014. ↑ "Broken Bells Album & Song Chart History". Billboard Adult Alternative Songs for Broken Bells. Prometheus Global Media. Retrieved February 16, 2014. ↑ "Broken Bells Album & Song Chart History". Billboard Alternative Songs for Broken Bells. Prometheus Global Media. Retrieved February 16, 2014. ↑ "Broken Bells Album & Song Chart History". Billboard Hot Rock Songs for Broken Bells. Prometheus Global Media. Retrieved February 16, 2014. ↑ "Discografie Broken Bells Wallonie". ultratop.be. Hung Medien. Retrieved October 1, 2016. ↑ "Broken Bells Album & Song Chart History". Billboard Canadian Hot 100 for Broken Bells. Prometheus Global Media. Retrieved February 16, 2014. ↑ "Broken Bells Album & Song Chart History". Billboard Japan Hot 100 for Broken Bells. Prometheus Global Media. Retrieved February 16, 2014. ↑ "Mexico Ingles Airplay". Billboard.biz. ↑ "(Holding On For Life) CHART: CLUK Update 15.02.2014 (wk6)". zobbel.de. Retrieved October 27, 2016. ↑ "Broken Bells – Chart History – Rock Digital Songs". Billboard.com. Billboard Magazine. Retrieved 19 October 2016. ↑ Blistein, Jon (2015-09-24). "Broken Bells Return to Intergalactic Disco on 'It's That Talk Again'". Rolling Stone. Retrieved 2015-09-28. ↑ "Grammys 2011 Winners List". Billboard. February 13, 2011. Retrieved February 3, 2014.